HDC MDS Medical 2015 will take place at Bahra University Campus, Waknaghat, Solan Himachal Pradesh. All information related to the HDC MDS 2015 are mentioned below. The candidates appearing the HDC MDS Medical 2015 are a must to have the Indian citizenship. The applicants must have cleared the BDS examination from any of the Dental College or any Institution recognized by the Dental Council of India. The candidates must have completed one year of compulsory rotating internship, the one year being completed by 31st of March, 2015 from recognized colleges by the Government of India or by the Dental Council of India. The candidates must have been registered with any of the State Dental Council during the admission procedures. The candidates appearing the HDC MDS Medical 2015 must have a conduct certificate being given by the Head of the Institution he/she attended. All the required certificates and documents above mentioned are to be submitted in original at the time of counseling, and failing to which can cancel the process of admissions of the particular candidate. Candidates who have already taken admission into a course in any other institution can only be eligible to apply for another course if he/she clears the first course. Also he/she needs to give an undertaking for this. During the admission procedures the candidates are required to submit the bank guarantee in favor of the institution for the remaining fee due. 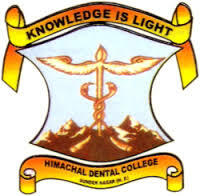 Candidates appearing HDC MDS Medical Entrance Exam 2015 can get all necessary information related to the exam on the oficial website of Himachal Dental College. of HDC MDS Medical Entrance Exam 2015. The application form for HDC MDS Medical Entrance Exam 2015 is available on the website of Himachal Dental College The form needs to be downloaded by the applicants, and after filling it with requisite details and attached with necessary documents it is to be sent to via registered post along with a Bank Draft of INR 2000/- in favor of Kalsi IT Solutions, Payable at Ludhiana. The last date of sending the admission details is April, 2015. Certificate of completion of Internship along with the date of completion mentioned and the date should not be beyond March, 2015. Proof of the institution/dental college from which the candidate cleared the BDS exam is recognized by the Government of India or by Dental Council of India. The certificate has to be signed by the head of the institution. Candidates failing to bring the proof of validated institution/Dental college will not be considered for the admission procedure. Conduct certificate of the candidate issued by the last institution attended, also needed to be attached with the form. The registration certificate of the candidate with any of the state dental council is also needed to be produced during admission and a copy of it is to be attached with the Entrance exam form. The syllabus for the HDC MDS Medical Entrance Exam 2015 comprises of 6 subjects: Oral Pathology, Periodontics, Orthodontics, Prosthodontics, Endodontics and Pedodontics. The test will be conducted on April 2015 at the test Campus, Bahra University, Waknaghat, District-Solan, Himachal Pradesh. The duration of the test is of 2 hours between 11.00 am to 01.00pm. The exam will be of one paper of 100 marks with multiple choices. A total of 100 multiple choice questions carrying 1 mark each, are to be answered in the exam. There will be no negative marking for wrong answers. As per the regulations set, scores below 50% in the Entrance test shall not be taken into considerations for the MDS course. A sealed test booklet will be given to every candidate appearing the exam, on the receipt of which the candidates are supposed to go through the instructions written on the booklet. Candidates are required to verify the booklets, in term of the number of question mentioned in the booklet are 100 or not, and if any fault noticed immediately it is to be brought in the notice of the invigilator, if the candidate notice any fault after 30 minutes of the commencement of the exam and notify the invigilator that will not be entertained. The commencement of the exam will be on the said time as on the prospectus and brochures and will be intimated to the candidates by the invigilator. No student is allowed to enter the exam hall after 15 minutes of the commencement of exam. After filling the test booklet, it is to be handed over to the invigilator before leaving the hall, candidates failing to do so will not be considered and will be declared failed. There are no procedures of re-evaluations and rechecking. The Medical Entrance Exams are among the most important entrance exams which held in the country. The topics which are covered in the Himachal Dental College MDS 2015 are Oral Medicine, Endodontics, Orthodontics, Oral surgery, Prosthodontics, and Generic Medicine. To initiate the preparations of the exam there are several steps which are to be followed. Setting up a Plan : The students appearing the medical entrance exams 2015 are needed to have a secured plan in order to attain success in the entrance exam. The plan needs to be practical and should also go with the daily routine requirements along with the time schedule of the candidates preparing for the exam. The students need to follow the prepared plan of study and work accordingly. The plans are to be made keeping in mind the time left for the exam, exam pattern and also the syllabus of the entrance exam. The plan has to be such which decreases the strains and boost the confidence of the students. Steps to be covered : The topics which are to be covered have to be scheduled according to the difficulties of the students in solving the problems of the same subjects. More importance is necessary to be given to the subject where the level of difficulty reaches a peak. Collection of previous years question papers are a good way to reduce the pressure of the exam by appearing them all in the shortest time possible. This increases the confidence of the candidates appearing the exam as well. Also this can help in finding the difficulty areas of the students. Covering the maximum topics possible is also a safe way out to appear the exam and succeed. The revision of the topics where they find difficulty can build their strength and can solve the questions related to the same appearing in the exams with ease. The mock tests are also one of the better solutions to reduce the pressure of exam and practicing the areas of difficulties being faced in solving the mock test papers. Dental Matrix Solved 2001 -2010. Mudit Khanna & Amit Ashish. Candidates who have passed the Entrance Exam 2015 are supposed to attend the counseling at Himachal Institute of Dental Science, Rampur Ghat Road, Paonta Sahib, on  April 2015 at 10.00 am with all the original documents and the admit card for the exam. The HDC MDS Medical Entrance Exam 2015 cutoffs are the minimum scores which are scored taken into count for the admission procedures. The candidates securing scores above cutoffs are sent invitations to be present for the counseling process.